Many people blame Serato for not adding more alternatives to synchronize Serato DJ Pro with external hardware like drum machines, samplers or any kind of synths and groveboxes. Although Ableton Link – which has been supported by Serato for almost two years – is cool for syncing with another music software or mobile app, it’s almost useless with external hardware. As far as we know, the Akai MPC Live, MPC-X and the SPINK0 DIY Eurorack compatible circuit are the only hardware with integrated Ableton Link protocol. 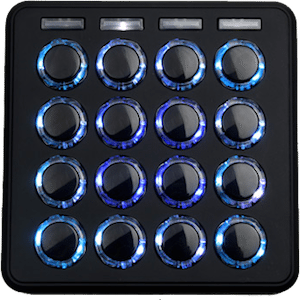 For many years people have asked Serato to integrate a classic solution, MIDI clock. This is is supported by almost every piece of music hardware, but Serato has never added it. Today we’ll show you four different alternatives for syncing Serato DJ Pro with external hardware. 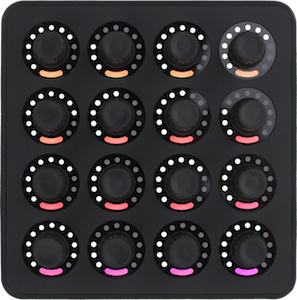 With the help of additional software or hardware, you will be able to generate your own MIDI clock signal for syncing with everything. It’s much more easy, cheap and reliable than what you are probably thinking. Warning: today’s article shows solutions mostly for Mac users. Have some good tips on this for Windows users? Please share in the comments! If you have an iOS device – iPhone, iPad, iPod Touch – you have access to the best solution. There are two fantastic apps that can do a good real-time conversion of the Link protocol to a MIDI clock signal. Both apps are cheap, and both will turn your iOS device into a “Link protocol conversion box”. You can use both apps with your iOS device connected to your DJing computer using the lightning cable, or you can use them wirelessly. After some testing I can say that MIDI Link Sync is more reliable using wi-fi, while Link To MIDI works tighter connected to the computer. In fact, Link To MIDI gave me several problems simply trying to join the network MIDI session of the computer. 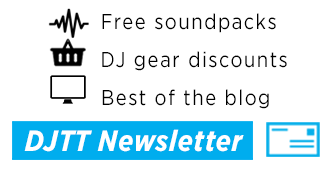 Now, let’s say we want to sync Serato with a common Roland TR-09 boutique connected to the USB port of your computer. Below, I explain how to set up MIDI Link Sync wirelessly and how to set up a wired connection with Link To MIDI. First, open the macOS Audio MIDI Setup app from Applications > Utilities. 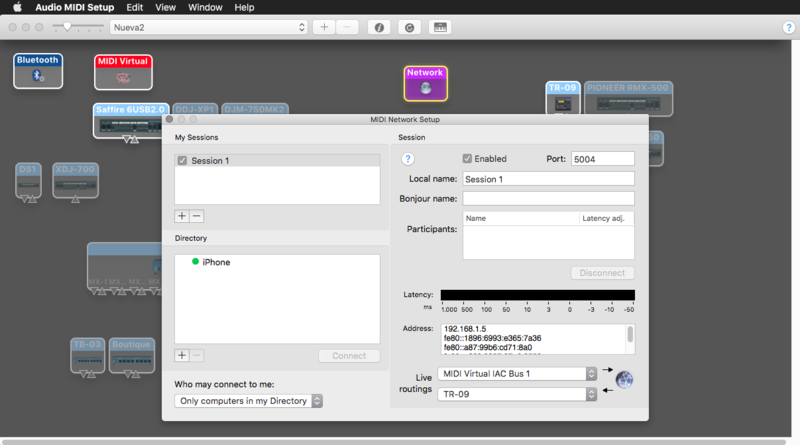 Once open, if you can’t see your MIDI devices, click on Window>Show MIDI Studio. Double click on the Network Icon, and in the pop up window check if there is at least one session created. If there is one, make sure that the “Enabled” option is checked. If not, create a session clicking on the “+” icon under “My Sessions” and enable it. Now take your iOS device and connect it to the same wi-fi network as your DJing computer. 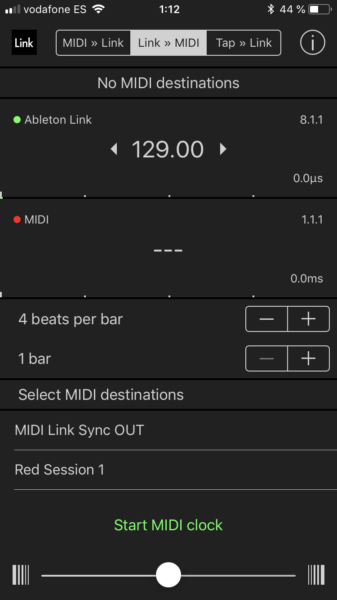 Now open the MIDI Link Sync app and in the lower area of the screen, check that under “Select MIDI destinations” the port Network Session 1 (or the name you used for the network MIDI session) appears, and if it’s there check that port. If not, something is wrong with the network MIDI and you have to go back to the beginning. 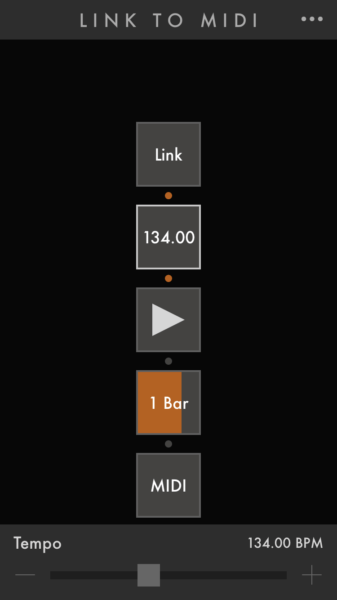 Select the “Link >> MIDI” tab in MIDI Link Sync and enable Link in Serato in the upper left corner of the screen and in your playing deck, and make that deck play. MIDI Link Sync must detect the Link protocol – Serato must be playing and Link enabled – and show it as a green line moving from left to right, with the same BPM value as in Serato. Now tap on “Start MIDI Clock” down in the screen of the iOS device and a moving yellow line under the green one should appear. After two bars, the MIDI clock should be aligned with the Link protocol and both lines will be green. Congratulations, you are sending MIDI clock from Serato via your iDevice. Now to make that MIDI clock signal arrive to the TR-09. Go to the Audio MIDI Setup app, double-click the Network icon. In the “Live Routings” area you have two drop-down menus, in the last one select the TR-09 MIDI in port. Your TR-09 should be receiving MIDI clock now and showing ———— in the display if you are in pattern mode. Let’s try now with a wired setup. 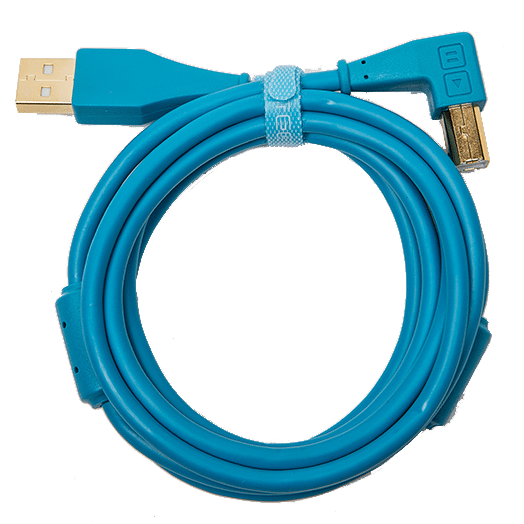 Connect your iDevice to your Mac with a lightning to USB cable. We don’t recommend using a USB hub. Open Audio MIDI Setup and in the Audio Devices window you will see your iDevice on the left side with a “Enable” button just below, click on that button. 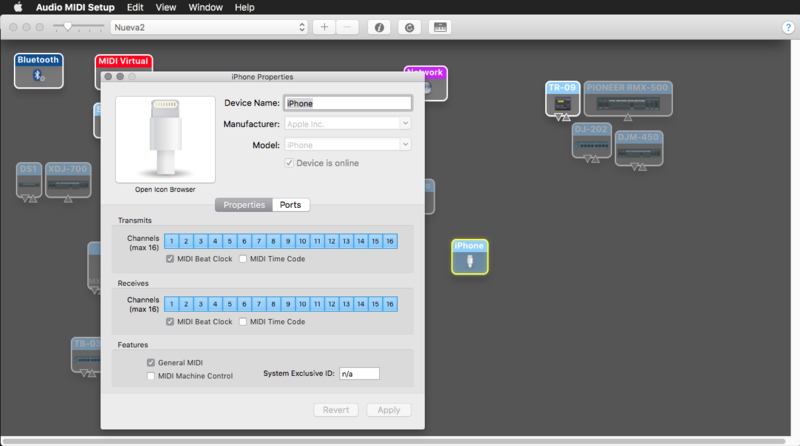 Your iDevice will appear now as a MIDI device in the MIDI Studio windows, so double-click on the icon. In the pop-up windows make sure that the “MIDI Beat Clock” checkbox is enabled on both input and output ports. Now open Link to MIDI and tap on the MIDI icon in the lower area of the screen. 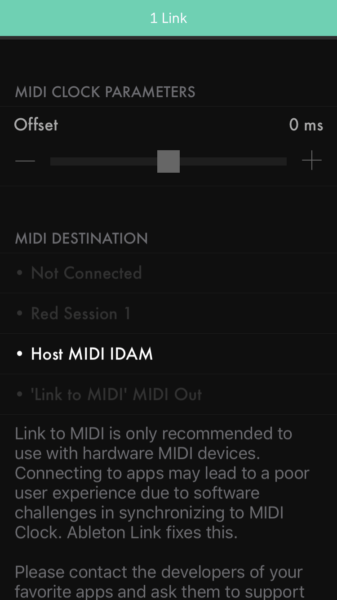 In the options screen that pops up, under the “MIDI Destination” option select “Host MIDI IDAM”. Tap on “Done” in the upper right side of the screen. Then, enable Link in Serato and play some music, a notification telling you that the app found a new Link a should appear in the iOS app. Press the play button in the Link to MIDI app, and your iDevice will send MIDI clock. 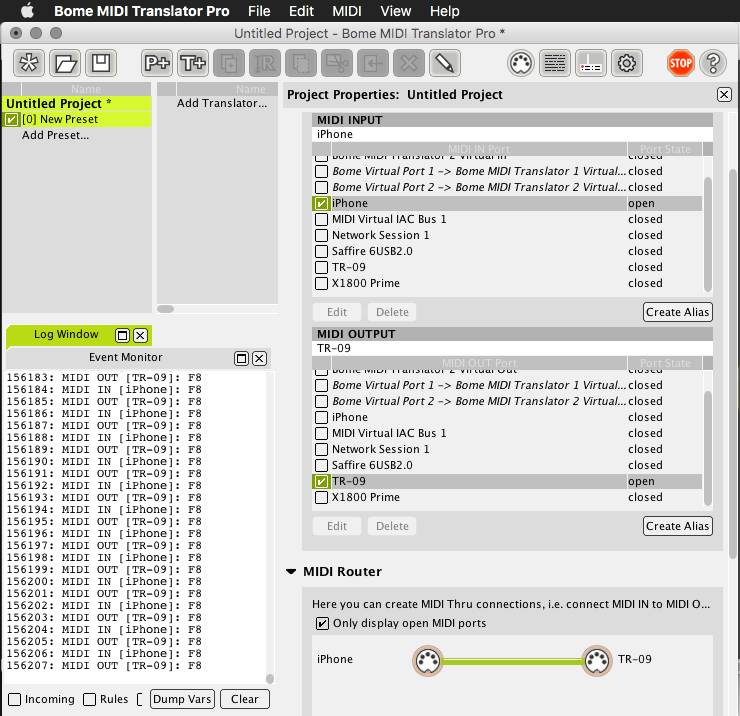 Now you have to create a “thru” connection between your iDevice and the TR-09 MIDI in port, there are several software options for this, but my favorite is always Bome MIDI Translator. Open BMT, start a new project and in the MIDI In port selection just select your iDevice and in the MIDI Out port selection select the TR-09. 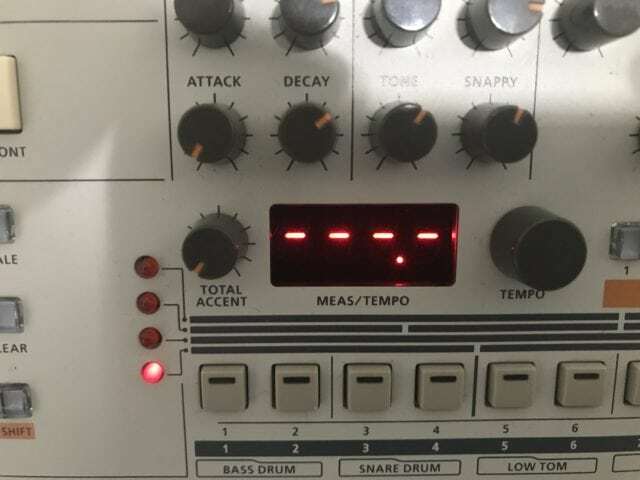 Both ports should appear in the lower tab as icons, so now just trace a line between them for making a “thru” connection and your TR-09 will be receiving MIDI clock. Enable Link in Serato DJ Pro and in the decks you will use. Play some music! 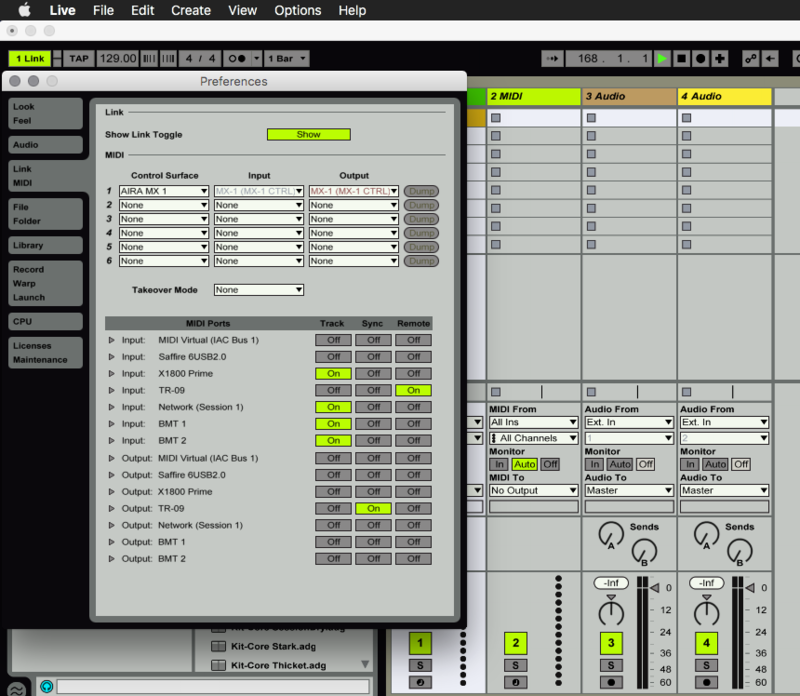 Open Live and go to Ableton Live>Preferences>Link MIDI tab. Remember that we where using a TR-09 as an example, so look for the TR-09 MIDI output and check ON in the Sync option. Also check “Show Link Toggle” option in the upper side of the tab. Close the preferences. Activate Link in Ableton – top left area of the layout. 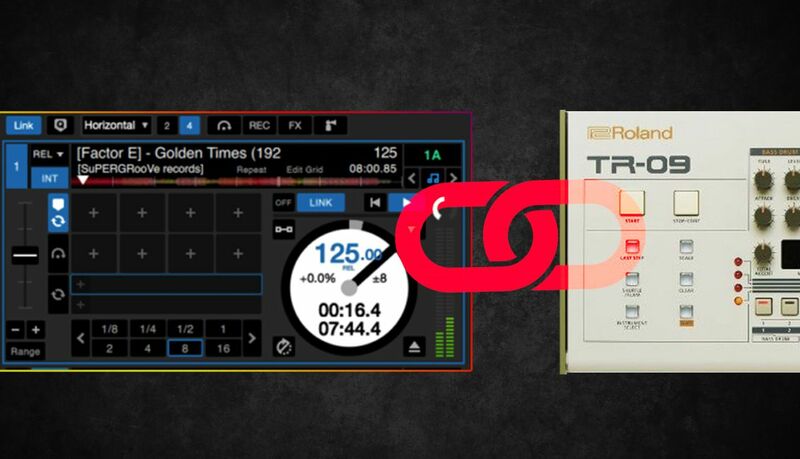 Live should detect Serato DJ Pro and show “1 Link” in the Link button. When you press Play on the transport controls, Live will start to send MIDI clock to your TR-09 and the MIDI clock out LED next to the Link button will blink in orange. If you don’t have an iOS device, you can try a simple software for macOS called Waveclock. 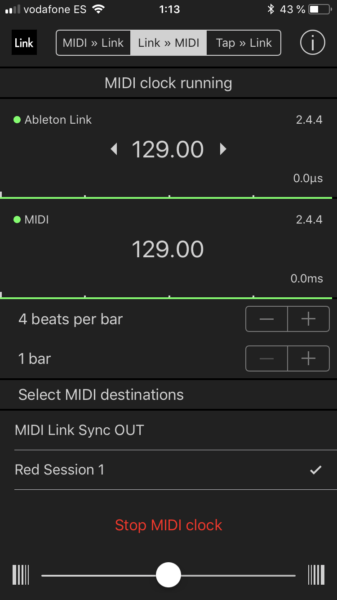 This app is bit more expensive – 30€– and works in a different way than Link to MIDI and MIDI Link Sync, because instead using of the Link protocol to generate the MIDI clock, this software analyzes the incoming audio and generates a MIDI clock signal based on the detected BPM. It is not as accurate as the iOS apps or Live, and it works better with four-on-the-floor techno or house with a very loud bass drum. Waveclock also is a bit older (last updated in 2011) but it still works with latest macOS versions like Sierra / High Sierra. After testing Waveclock with different music genres I’ve found that the best way to use it is sacrificing one of your decks using that deck as a “click track” for Waveclock. That’s only really possible if you have a four deck Serato setup. Let’s see how to do this. First, open Serato DJ Pro, and in your fourth deck load a track that has a raw four-on-the-floor drum loop with only a very loud kick drum, make a 1 bar loop using Serato auto loop function and play that loop. Depending on the Serato hardware you are using, the next step may differ a bit; if you are using a SL4 you will only need to connect the output of that deck to one of the inputs of the interface or to another interface connected to your computer. 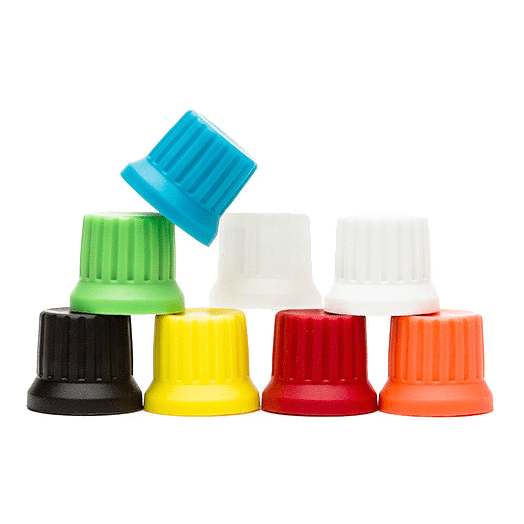 If you are using a certified club mixer you probably don’t need to do anything else, because almost every digital mixer routes the audio coming from DJ software to the input channels of the mixers. 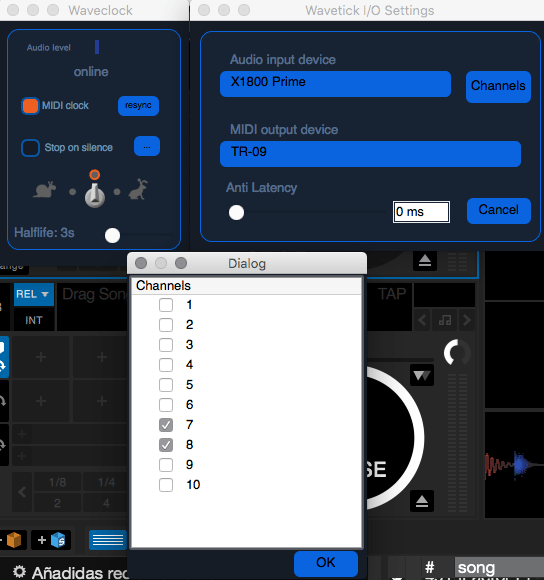 Now open Waveclock and in the Waveclock>Preferences menu, in the “Audio input” drop-down menu select your digital certified mixer/hardware interface, and in “Channels” select the ones you are using for outputting the four-on-the-floor drum loop. In the MIDI output device select the TR-09 (or the whatever hardware you want to sync). 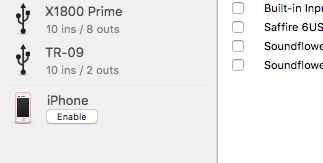 Close the preferences, uncheck the “Stop on silence” (I don’t like that option, a little dangerous) and in the “speed switch” select the center option, which is the proper one for music between 110-150 BPM. 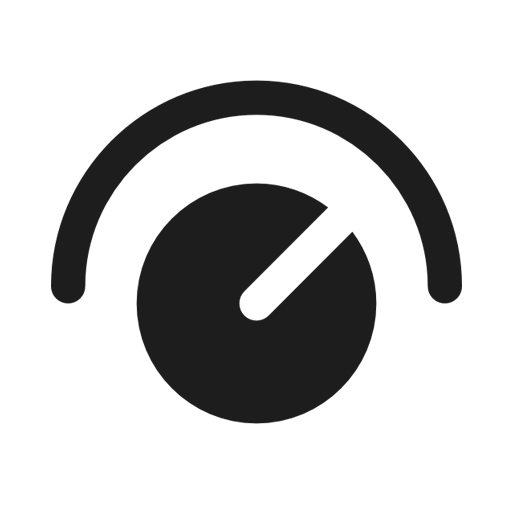 Now, press play in the drum loop deck of Serato DJ Pro and check that Waveclock receives the audio signal by looking at the “Audio level” VU meter. If everything is correct, Waveclock will start to send MIDI clock to your external gear. I also have heard that the Xone:DB4 can also do this, but I have never tried but myself; if someone tried please tell us at the comments. If someone knows any other certified mixer or controller that also has this feature, also feel free to tell to everyone at the comments. It would be a little long to explain how to activate MIDI clock in every device. So just check the manual for the instructions on how to activate the MIDI clock, and just activate it when using Serato; theh MIDI clock signal will be synced with Serato BPM and beats. That’s all for today. If you know any other ways to sync Serato DJ Pro with external DJ gear, tell us in the comments!